This stitch pattern was requested by one of my YouTube friends! Before I get into the details, I want to share a short story about this stitch pattern with you. 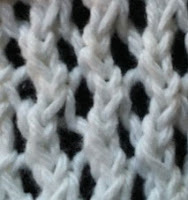 Back when I first began knitting, I came across this particular stitch, I think on a website. 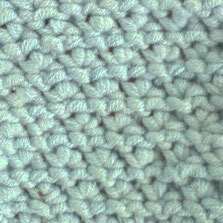 The picture of the stitch did not show the points at the bottom of the fabric, just the middle of the sample. 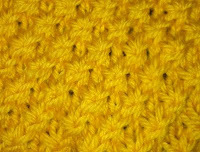 I did not know the stitch would cause the fabric to come to points, and so as I was knitting my scarf, and the points were forming, I was a little concerned but not much. I figured that I could block it into shape! (I don't know why I thought the fabric was not supposed to do this, but I did.) I was using a cheap acrylic yarn, and of course blocking did not help. So I decided to iron it instead. No matter how hard I tried, I could not get rid of those points! I did do a pretty good job of completely flattening the yarn though. I never wore the scarf, and am not even sure what ever happened to it. At some later time, I came across this stitch pattern again, where someone did show the points in their picture, and I felt like a complete idiot. So, just incase you, dear knitter, are not aware that this stitch pattern will produce lovely points on your fabric, I have made sure that the points are included in the sample pictures above. Now. Here are the details. The instructions below will give you fabric that looks like the first picture, with the black and white yarn. You certainly are not limited to only two colors, or to switching colors after Row 4. Feel free to use as many or few colors as you like, and switch them as often as you like. 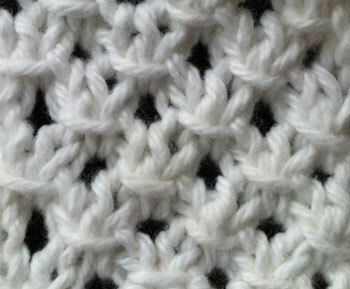 You may also see this stitch pattern named Afghan Stitch - there are a number of variations on this stitch pattern. Whatever you call it, or whatever particular method you use, you will end up with something that looks like the pictures above. A couple of weeks or so ago, I posted this stitch pattern for either left or right slanting fabric, and noted that I would be posting the vertical version at some point in the future, or sooner if requested. 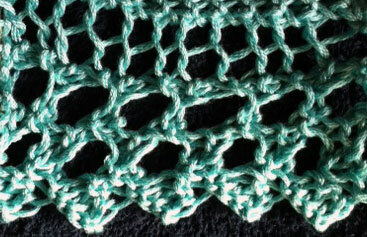 It was requested, so here is the pattern for the vertical version of Trellis Lace! I think this is my new favorite rib stitch! How cool is that zig zag effect?! The look is achieved by working stitches out of order on each side of the fabric. Looks like you did a lot of work, but this is really an easy stitch to master. The first couple rows or so were a little tight for me, but once I got going I didn't have any problems. 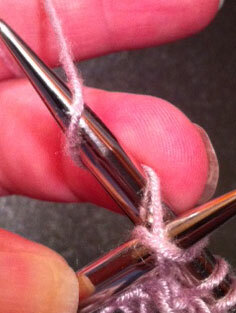 It is also a tiny bit tricky working the stitches, but you will be zipping along once your hands get used to the motion. How pretty is this? I thought it was time for a little color work. 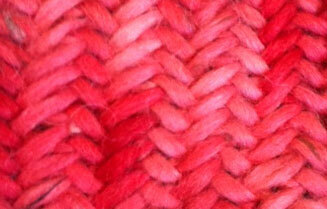 I don't often knit with more than one color, but this stitch makes me want to! It is much easier than it looks too. This pattern begins with 10 rows, then after the initial 10 rows you will only be repeating 3-10. Row 1 is a knit row, and Row 2 is a purl row, which gives you a stockinette base. Despite being all knit/purl rows, this fabric lays flat; there is no curling. 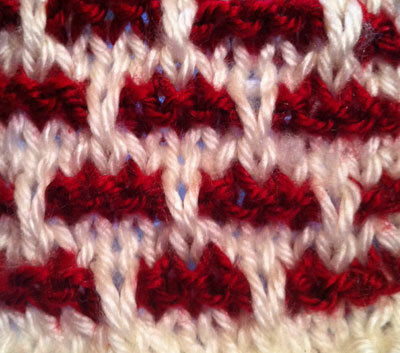 I think the edges are pretty darn sloppy, even though the pattern suggests an extra stitch on each edge for neatness. 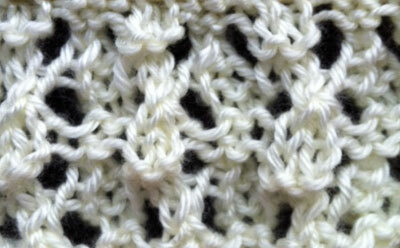 I would probably add a few more stitches to the edges for a more significant border. Repeat from ROW 3 for pattern. 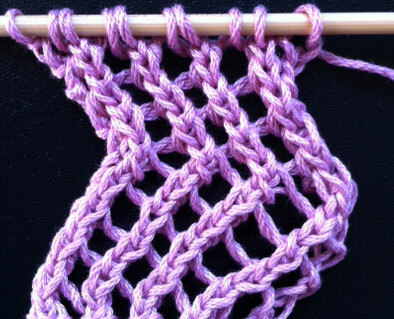 I have been wanting to learn this stitch for ages! However, the written instructions stumped me to no end. It just didn't make sense to me. Recently my sister was here for a visit, so I asked her to see if she could figure it out. Of course, she did! She has a knack for being good at all things crafty and creative. I think it took her all of 10 minutes to master Veil Stitch! 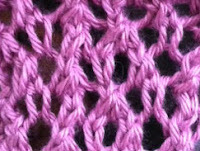 Not so much a stitch as it is a technique, Veil Stitch elongates and twists the stitches and produces a mesh-like fabric that is beautiful. I debated whether or not to even post written instructions or not, since it is hard to describe - and I decided that along with a few pictures, it might make a little sense. There is a video of course, so if the pictures and words don't make sense, give the video a try. You probably won't get it the first (or second, or third) time you try, but don't give up!! Once your hands get used to the movements, it's a piece of cake! I promise. And you will be glad once you get the hang of it. 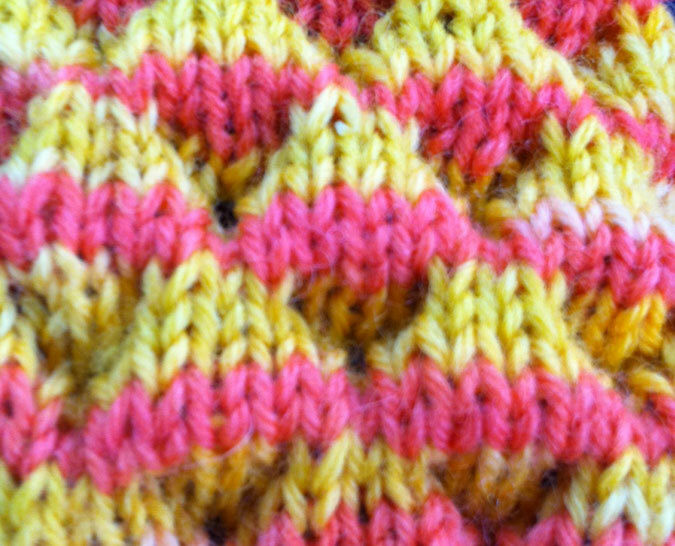 Work on any number of stitches you like. 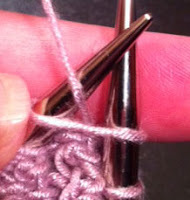 1: Insert the right needle into the next stitch on your left needle, as if to knit. Do not make a knit stitch though! 5: Pull the yarn through the front leg of your original stitch from the left needle - just as you would for a normal knit stitch and let the yarn drop from the left needle. Now, take the yarn over the top of the right needle. 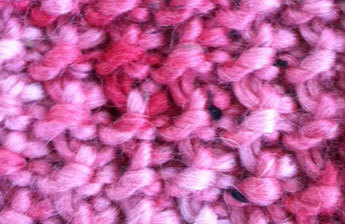 Do you see how the yarns form an 'X'? 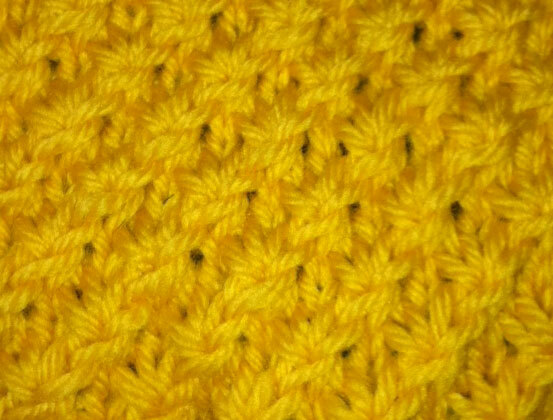 The strand that is slanting from left to right, is the front leg of the stitch on the left needle. Pull the yarn through the front leg of the original stitch on the left needle - just as you would when making a normal knit stitch. Your needle is already through the front leg of that stitch, all you are doing now is pulling the wrap from the step above back through that original stitch. Remember the 'X' your yarn made? You are pulling the yarn through the bottom of the 'X'. Finally, here is the video, which along with the pictures I hope will help you to get the hang of Veil Stitch. Good luck and Enjoy! This is the next stitch in the Vintage Series that I love. 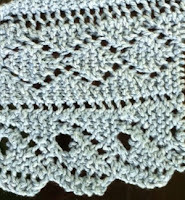 This one comes from The Lady's Knitting Book, Second Series published in 1881 by E. M. C.
The pattern calls for "plus 2" stitches - one to be knit on each edge. 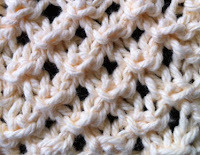 If using this stitch alone in your pattern, I would add a few more to make a wider border, because the edges look a little sloppy to me. If you are a tight knitter, try to loosen up a bit, or use a larger needle so the 'knit 3 together' will be a bit easier on you. Repeat these three rows for pattern. I've decided to post an additional stitch for this week, since "A Pretty Stitch" is a duplicate :0) Also, this stitch was used in one of the scarves I showed you in my How to Knit a Scarf video, and someone had asked about the pattern. There is no pattern for the scarf itself, I made it up and didn't bother to write it down. 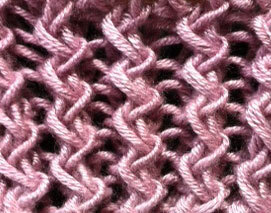 I just added a simple garter/yarn over border to the Ripple Stitch pattern to make the scarf. Looking through the stitches I have covered so far, I realized that I haven't paid much attention to cables. Not because I don't like them, but mostly because the cable patterns I lean towards are too long to video, and I like to have a corresponding video for the stitch patterns I post. Then I found this one, which is only a 4 row repeat on 10+2 stitches. 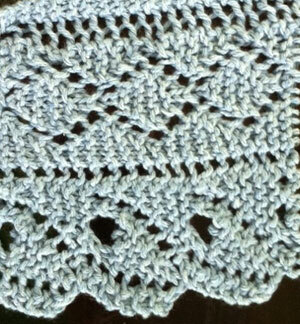 Another beautiful vintage stitch - Alencon Lace. 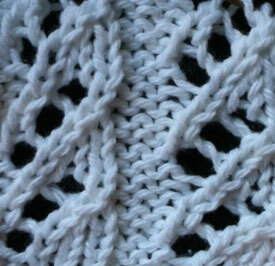 This makes a narrow lace edging, good to use on whatever you like. YO(2) - make a yarn over twice - wrap the yarn around your needle two times, instead of once as for a regular yarn over. Both of these wraps will be worked in the next row. In Row 2, the P1 is to be worked on the second wrap of the double yarn over from Row 1. To make a yarn over at the beginning as in Row 2, just place your right needle under the yarn, hold it in place with your index finger, and then begin knitting as normal. Repeat these four rows until the piece is as long as you like. And here is the video - don't mind the cat. Sorry for the funky lighting on this one; it is extremely windy today, so I filmed inside in front of a window. The sun was behind a tree outside of the window, so you can sometimes see shadows moving around - that is the branches of the tree blowing around. I am in love with this stitch! How pretty is this?! This was published in the NY Tribune on May 29, 1881. The paper does not specify how one would use this - it looks to me like an edging. 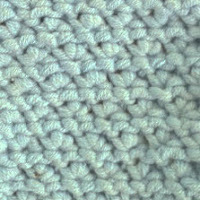 In my video for this stitch, I say it is worked on a multiple of 23 stitches, however, after looking at the pattern again, I believe it is just the 23 stitches - if there is a way to widen the fabric, I cannot find instructions on how to do so. So, yes, I would say this is to be used as an edging - maybe use a nice lace weight yarn and then sew it on to the top of a curtain is what is on my mind right now. I have been itching to knit a curtain for my back door; but as I don't have time to knit a whole curtain, this would probably scratch my itch were I to just get a plain white piece of fabric to use as the curtain, and add this to the top. 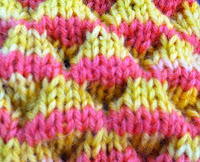 This is not a stitch pattern you can sit down and knit while watching TV - it requires a bit of attention. At least for me it does. In Row 1, YO means you will make a yarn over 4 times - wrap your yarn 4 times around the needle to make 4 new stitches (this part is in the video). 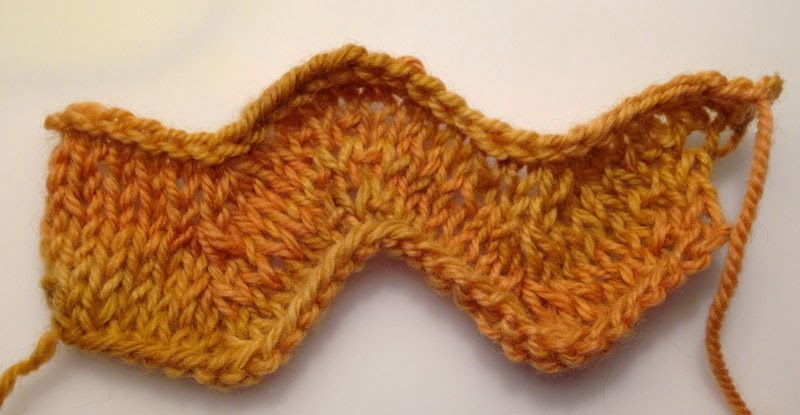 Row 7 - K3TOG is not a typo - knit three stitches together. This can be a little tricky - put your needle into each stitch separately and give it a little wiggle to help loosen the stitches; this should help you work all of them at the same time. 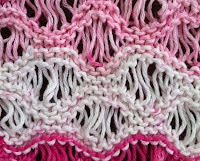 Repeat these 12 rows for desired length. Now, here is the video. 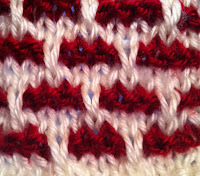 This is far too long a stitch pattern to do the whole thing, so I have shown only how to do the quadruple yarn over in Row 1, and then how to work those extra stitches in Row 2. I also show how to bind off the first 3 stitches in the last row, just in case you have never done this before. 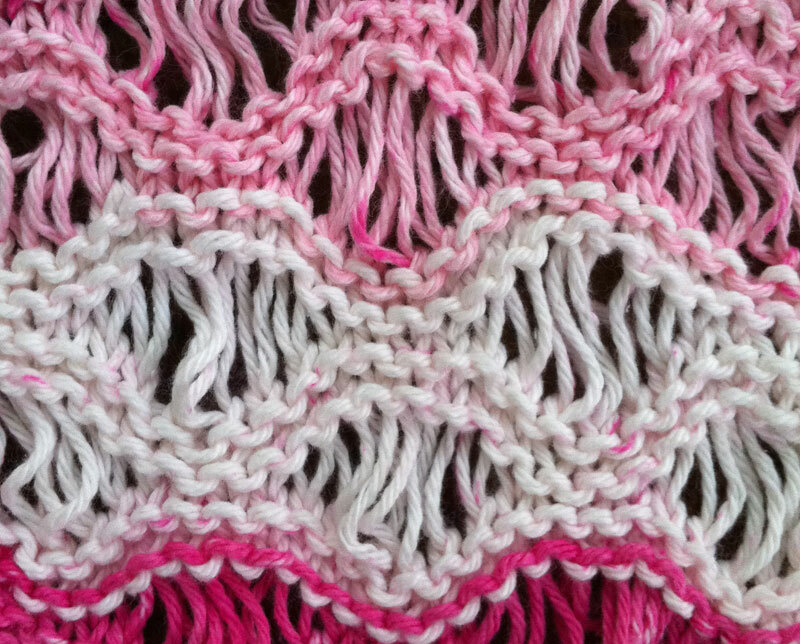 This is a fun, funky stitch that, while it takes a bit of practice, is not as hard as it may look. I would recommend using this only as an accent on the ends of a scarf, or other small project for the simple reason that it uses up a good deal of extra yarn to make the loops. However, you can do a whole project using this stitch if you wish. I have seen this in several stitch books and around the net, and honestly the instructions are a bit confusing. I am going to write it up as it makes sense to me, and along with the video I hope makes sense to you as well. 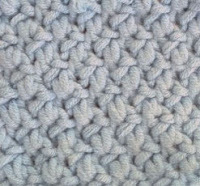 This stitch has a lot of flexibility; I think it looks best in a medium weight yarn, but feel free to use any yarn you like. 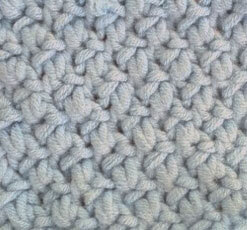 In the above sample, I made double loops in each stitch. 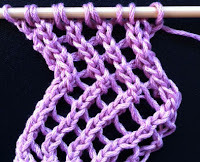 If you decide to use a chunky, thick yarn, you may want to do every other stitch, or just single loops. Also, you can play around with which rows have the loops - maybe every few rows for example. Again... up to you! Insert the right needle into the first stitch on the left needle, and make a knit stitch as normal, but don't drop it from the left needle. Bring the yarn between the needles to the front of the work, then under and over the right thumb, and back between the needles. Bring the yarn over the top of the left needle, over the top of the right thumb, and then between the needles so that the yarn is in the back, in position to knit. 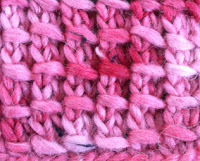 Now, slip the second stitch on the right needle over the stitch just knit. Gently pull on the loops to snug up the stitch. 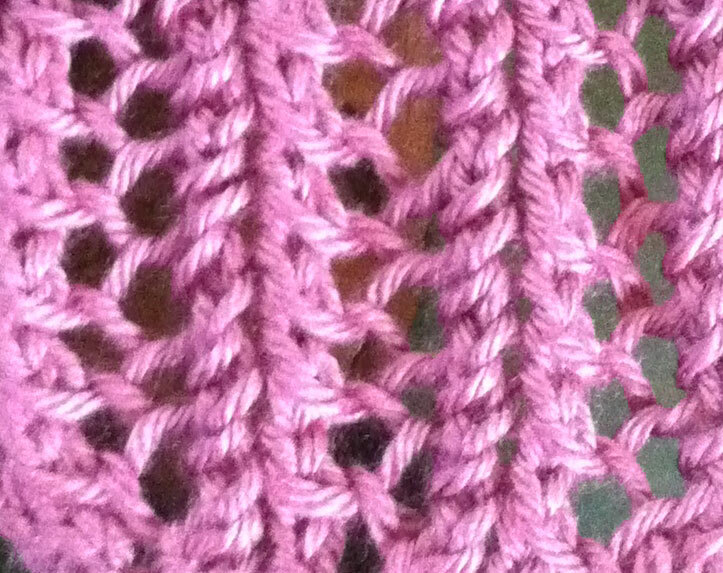 Repeat to end of row, knit 1. 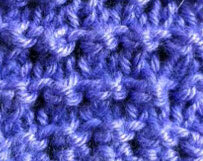 Insert the right needle into the first stitch on the left needle, and make a knit stitch as normal, but don't drop it rom the needle. Bring the yarn between the needles to the front of the work, then under and over the right thumb, and then back between the needles, so that you are ready to knit. Knit the stitch and drop from left needle. 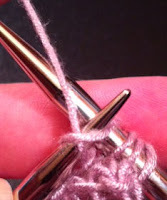 Now, slip the second stitch on the right needle over the stitch you just knit. Gently pull on the loop to snug up the stitch. Now, I am sure this is very confusing in writing. So, here is the video of how the loops are made. Enjoy! For Crossed Stitch, work with an even number of stitches, plus 1 more on each side for the selvage. This is a two row repeat that is easy to remember. Depending on what you are making, the number of edge stitches can be adjusted to fit your project. 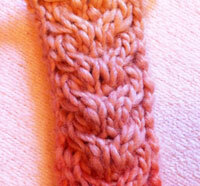 You can make the cloth wider by adding more stitches, just be sure you have an even number. 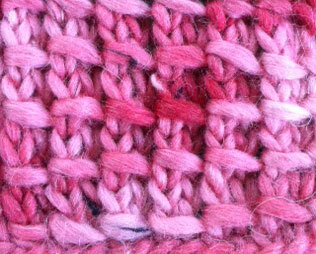 The cloth can be made longer by repeating Rows 3 and 4 as many times as you like before finishing. I strive to be error free before posting something to the public, but sometimes that doesn't happen. If you find a mistake, feel free to leave me a comment so I can check it out. This cloth is my own design. 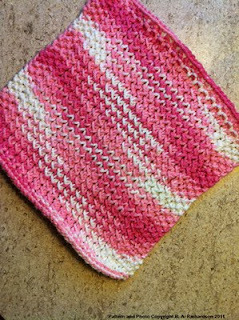 You are free to use the pattern to knit cloths for yourself and friends/family; if you would like to share the pattern with others via your own blog, please link back to me. Ribbing is back! For this particular rib pattern, you will be doing things a little differently than k2, p2 or what have you. 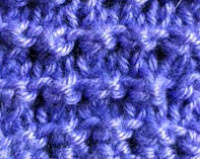 Row 2: Purl 1, Knit the stitch below the next stitch on the left needle, dropping both it and the unworked stitch off the left needle at the same time. Repeat to end of row, ending with P1. Confused? As always, here is a video to help you out. Enjoy! 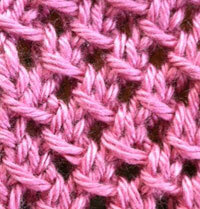 Want a free pattern for a hat knit with this stitch? Click HERE to go to the Star Struck Hat pattern! 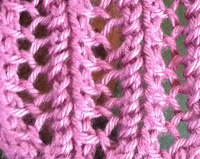 Round 4: Knit 2 *Make star, Knit 1* - continue to end of round. (You will only be knitting two at the beginning of this round. 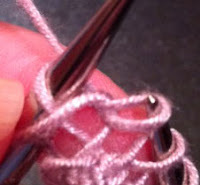 In all other instances, you will only knit 1) You will end the round by making a star; you will see that you have two stitches before your stitch marker, and one after the stitch marker. Slip two stitches to the right needle (slip purlwise so the stitches are not twisted), remove your stitch marker, and slip the two stitches back to the left needle. Now, make your star, and then slip one stitch back to the left needle, place the marker on the right needle. The marker will be back in the same position it was before you removed it to make the star and will correctly mark the end/beginning of the round.